Learn a bit about our exceptional team, and consider joining us! President: David E. Steele joined the board in January of 2014 and was elected President for the 2017 officer term. David is a business executive residing in Indianapolis. David is a distant relative of T.C. Steele; his grandfather Harry Steele and T.C. Steele were both great grandsons of Ninian Steele. David and his wife Lynne are lifetime members of The Friends of T.C. Steele State Historic Site, Inc. and together with their children, Ben and Emma, they have expanded the awareness and appreciation of T.C. Steele’s legacy in Indianapolis, and the generous restoration of the Boyhood Home of T.C. Steele by David’s cousin, Tim Shelly. Vice-President: Stephanie Dean first began volunteering at the T.C. Steele State Historic Site over 20 years ago and quickly joined the Board of the Friends. In the past she has served as Vice-President and President. During all her years on the board Stephanie has been the most regular volunteer for events at the Site. She has also been deeply committed to the philanthropic work of the Psi Iota Xi sorority for over 22 years. 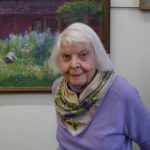 She also worked in recent years for the Brown County Art Guild as a gallery docent and gift shop salesperson. Stephanie’s husband Rick works at Crane Naval Supply Center but they chose to live in Brown County just north of Nashville where they raised their daughter Megan. Treasurer: Charlie Matson – began his volunteering at the Site in 1991 and has served as board Secretary and Treasurer in the past. He has completed the local training for non-profit board members and his present term with our Board will end in December 2021. Charlie’s primary volunteer activity for T.C. Steele beyond the Board has been writing original scripts for the murder mystery dinners and organizing those fundraisers. His other volunteer activities are mostly connected with his church where he has chaired several committees. After working for Georgia Power for over 17 years, Charlie moved his family in 1989 to Bloomington where he had purchased a small business. 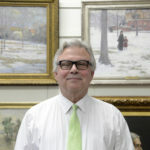 Charlie also worked for Indiana University for 23 years as an engineer and manager until he retired at the end of 2013. 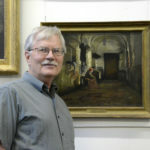 Painting has become one of Charlie’s retirement hobbies and he is a member of the Indiana Plein Air Painters Association. Charlie’s wife Katie is a retired Registered Dietitian and is a distant relative of Ada Walter Shulz, one of the original members of the Brown County Art Colony. Charlie and Katie enjoy collecting Indiana paintings and pottery and they are Life Members of the Friends. They have two adult children and three grandchildren. Secretary: Pauline Archambault – Pauline is one of the newest members of the board of the Friends of T. C. Steele, having joined in July of 2017. Her primary mission on the board is to coordinate and assist with fundraising efforts. Born and raised in Strasbourg, France, Pauline came to the United States in 2007 to study American Literature at Indiana University where she also taught French and English Composition. 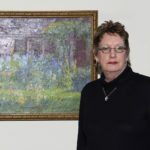 She has resided in Cincinnati, OH, since 2012, where she completed a Master’s Degree in Art History and now works as a Fine Art specialist and appraiser at Cowan’s Auctions. Prior to that, Pauline interned and volunteered at multiple art institutions, focusing mostly on education and programming. Though she enjoys a wide array of artistic styles, Pauline is especially interested in French Realism and French and American Impressionism. 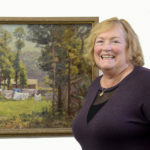 In the context of her work, Pauline has had the opportunity to research and sell several works by T. C. Steele, who stands as her favorite Indiana Impressionist. Aside from her passion for art and literature, Pauline enjoys traveling with her husband and baby boy Adrien, and hiking with her dogs. Garrett Adams – Garrett is the newest member of the board of The Friends of T.C. Steele and a lifetime resident of Indiana. 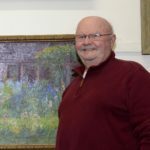 Garrett has a strong appreciation for artwork that reflects expressionism including Edvard Munch and Leroy Neiman, and an appreciation of post-impressionist painter Vincent van Gogh. Garrett earned his Bachelor’s Degree in Chemistry from Franklin College in 2011 and his M.B.A. from Butler University in 2017. 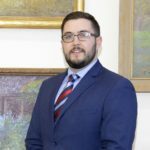 He currently resides in Indianapolis and works as a Pharmaceutical Project Manager for Eli Lilly & Co. Garrett’s community involvement includes not only the arts, but politics and other philanthropic organizations as well. Garrett serves as a Precinct Committeeman for Washington Township and is a Board Member and the Treasurer of the Indianapolis Echelon Chapter of the Salvation Army. Catherine (Cathy) Deuber Bengson – Cathy is the daughter of Ruth and Warren Deuber of Ohio. She is the great granddaughter of T.C. Steele. She has fond memories of Great Granddaddy Steele who lived in Woodruff Place in Indianapolis. Cathy and her husband Glen are both retired and live in Powell Ohio which is a growing suburb of Columbus. She spent her working years as an educator and resource person for Augsburg Fortress Publishers. More recently Cathy was the Executive Director of the Xenia Area Community Theater in Xenia. In addition to that leadership role, she ran a summer children’s program and performed and directed over ten years. Cathy has development experience as the Development person for Lutheran Outdoor Ministries in Ohio as well as fund raising for the theater. Cathy and Glen travel for several months each year enjoying new places and new cultures. She escapes into books and swimming as well as doing the “grandma” thing. Cathy and Glen are family members of the Friends and feel strongly that we have a responsibility to keep the memory of T.C. Steele alive. Her mom has done some research on T.C. Steele and James Whitcomb Riley. Debra T. Davis first began volunteering at the T.C. Steele State Historic Site eight years ago, when she began writing murder mystery dinners with Vice-President Charlie Matson. The humorous and dramatic fundraisers have provided many members of the public the opportunity to drive out to Belmont who might not have made the trip to our beautiful Site otherwise. 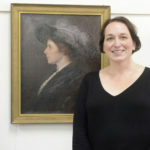 Debra joined the Board of the Friends in 2016. Raised in Indianapolis, Debra then spent seventeen years in Michigan, and happily came back to Indiana, to live among many other Hoo-Hoo-Hoosiers in Bloomington where she attended Indiana University and earned her JD. An attorney, she strategizes more than the average bear, and in her employment, works hard to protect children from abuse and neglect. She has spent twelve years as a member of Kappa Kappa Kappa, a service sorority, and also served on the board of Martha’s House, one of Bloomington’s homeless shelters. Debra is active in her church and is currently serving as Chairperson of the Leadership Council. Debra loves several kinds of art, but can only draw a straight line with a ruler. She and her husband love to attend other murder mysteries and to grow some of their own herbs and spices on their sunny deck. They have two grown children, each with a significant other, and a grand-dog, Winston. Jane DeVoe is one of the newer board members, and is excited to get involved with the Friends of T.C. Steele especially in the areas of educational programming for children, site use including the gardens for special events and programming for artists, education and inspiration. An educator, now pursuing post-graduate work in Educational Neuroscience, Jane is especially interested in the use of Art Therapy with children facing adversity and childhood trauma, and received certification in Brain, Trauma and Adversity at Butler University. In addition to experience as an educator and early childhood program coordinator, Jane has worked as a Special Events and Marketing Coordinator for a century old historic inn in Northern Michigan. Jane has two children Elizabeth Anne, a video and film production major focusing on documentaries at Purdue University and Theodore, a Fine Arts and Art History Major at Northern Michigan University, where he especially enjoys painting and wood block print making. A volunteer at heart, current volunteer interests include Teacher’s Treasures Board of Advisors, Gleaners Food Bank Mobile Food Pantry. IPS School 43, Scholastic REAL Program, Art With A Heart and Fairview Presbyterian Church. Jane also enjoys reading, cooking, textile art work, gardening, meditation and yoga and being in nature. One of her favorite places to be in nature year round is the T.C. Steele State Historic Site. Lane Dunagin is a lifelong Hoosier and has been employed in the energy sector for over 31 years and has been an industrial natural gas and chilled water consultant at Citizens Energy for the past 18 years. He is also the principal of a real estate investment business focused on acquisition and management of residential housing stock in Indianapolis. Lane has served on several task forces that are focused on “smart and livable cities”. His most recent role in this emerging area has been as a member of an advisory committee to former Indianapolis Mayor Greg Ballard, chartered with improving the public and private transportation infrastructure of Indianapolis. Lane is a Certified Industrial Gas Consultant by the American Gas Association. Lane’s professional affiliations include serving as the natural gas expert for Department of Energy and Environment Protection Agency for the State of Indiana, Toastmasters International, Board Member of Greater Indiana Clean Cities, and a favorite role of serving as the Director of Social Events for NFL Alumni Indiana Chapter. Lane has been married to his wife Shawn for 26 years. They have four children; Allison, who is a an Operations Supervisor at Community Physician Network, Zach, who is a junior at Indiana University (Go Hoosiers! ), Jacob, a freshman at Concordia University Irvine, CA on a track scholarship, who also is a school Mascot during sporting events, and Nicholas, a junior at Lawrence Central. In his free time, Lane enjoys playing golf at his member course Old Oakland. Lane enjoys supporting our youth and has been active in coaching and supporting roles for many years. He has been a long time mentor to Kyle Guy, the starting guard for the top-ranked University of Virginia Cavaliers and former Indiana Mr. Basketball. Kyle affectionately refers to Lane as “Pops”. Steve Fansler began volunteering at T C Steele State Historical Site in 2012. He started taking photographs for T.C. Steele events at the site. Steve has a degree from Indiana University School of Business. 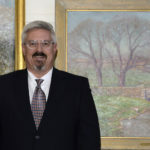 Steve was also Past President of Shelby County Shrine Club, Shelby County Master Gardeners, Shelby Art Guild Association, Shelby County I U Alumni club, He is also a Full Time Real Estate Broker with Carpenter Realtor. Steve after retiring has more time for his photography and time with his Horse Bosco. Michele New-Ritter first began volunteering at the T.C. Steele Historic Site in 2008 and served as a past board Secretary to the Friends of T.C. Steele. She has a passion for art and began studying and creating at age 6 and continues to this day working in several mediums. Her mother Vera encouraged her to read and Shel could often be found at the library checking out books of Monet, Picasso, Cezanne, Jackson Pollack, and others. Beginning as a self-taught artist, Shel was widowed at 52 and says; “I had to reinvent myself.” This transition entailed moving to Brown County to fulfill her passion as an abstract artist and teaching art. While in Brown County, she became involved in art scene in Brown County and Bloomington, Indiana. Shel taught a weekly senior art class from 2008-2009, and created several Bloomington exhibits for her senior art students. Also during her time in Bloomington, she was elected as 2nd Vice President of the Bloomington Watercolor Society and President of the Bloomington Professional Business Exchange. Shel left Bloomington returning to Indianapolis to care for her late father. 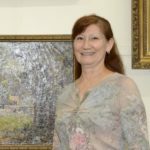 During this time she was a volunteer for the Indianapolis Art Museum for 2 ½ years, and awarded the Volunteer of the Department Award in 2015. 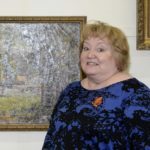 Shel has displayed her work in 13 Indiana art exhibits, including Bloomington, Muncie, and Zionsville and continues to teach art of all ages. She is the proud mother of two adult children, daughter Erika and son Aaron. Betty Wagoner graduated from Indiana University with a degree in fine arts. She taught art in the public schools. She received a Masters of Library Science from the University of Illinois. Betty was a professional librarian for 18 years in New York City. Recently, Betty taught watercolor painting and watercolor pencil in the Morgan County Library System and in the T. C. Steele Outreach Program. In 2017, she received an Arts in the Parks grant and taught watercolor and watercolor pencil painting at T.C. Steele State Historic Site and Starve Hollow SRA. Board Member Emeritus – Patricia Pizzo was the first President of the Board back in 1991 and has served the Site ever since, including a stint as Vice-President. Her present term on the Board will end in December 2019. Recently Patti has focused on recruiting new members for the Board. 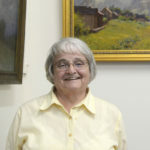 She has served many local non-profits as a board member including the Sycamore Land Trust and the Friends of IU Music. 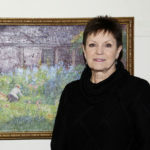 Patti also founded the board and membership of the Friends of Art for the IU Art Museum & School of Fine Art. Patti lives in Bloomington where three of her children and four of her grandchildren also live. The other children and grandchildren of her large family are scattered across the country. Ex-Officio Member – Andrea deTarnowsky is the Site Manager of the T.C. Steele State Historic Site where she is responsible for all aspects of day-to-day operations, financial administration, and long-range planning. 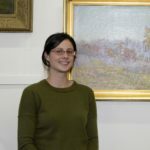 Andrea has been working for the Indiana State Museum system since 1990 after working two years at Culbertson Mansion, also a State Historic Site. She was also briefly acting manager of the Lanier Mansion State Historic Site while also managing T.C. Steele. Andrea was previously employed in the US Army museum division of the Office of Military History, and at Colonial Williamsburg. Beyond the management of the site, leading tours, teaching docents and running the Museum Shop are additional jobs Andrea handles at the TCS SHS. Among the programs she has launched at the site, she has been chairing the planning committee for the Wildflower Foray, a cooperative event for 25 of its 32 years. In her spare time Andrea helps her husband Pierre with their family farm north of Nashville where they have a dog, two horses and one cow named “Baby”. Accounting & Membership Coordinator – Tori Richardson performs all accounting and membership activities for the Friends of T.C. Steele State Historic Site, Inc. Spending most of her life in the Bloomington area, she has lived in northern Monroe County for over 20 years. Tori earned her Accounting degree from Indiana University. She worked for a regional office of the United Auto Workers in Indianapolis for more than 25 years. After retiring from the UAW, she now works part time at Indiana University in the Center for Applied Cybersecurity Research. Not one to remain idle, Tori also teaches dog agility and competes at a national level with her border collies.